I don't know about you, but I simply love it when a guy openly and confidently admits that a girl has made him weak-kneed. 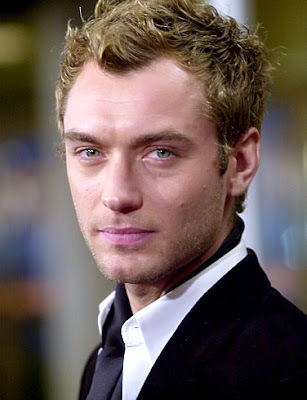 Especially if the guy is a well-known, in-demand brilliant actor, like Jude Law. And I think the girl he's talking about has an extra special place in his heart. Promoting his latest film, Sherlock Holmes, he admits in an article in Celebrity Baby Blog that it's his role as "dad" that takes first place in his life. He reflects on how fatherhood has changed him in so many ways. He is dad to Rafferty (13), Iris (9) and Rudy (7) with ex-wife Sadie Frost, and to Sophia (3 months old) with Samantha Burke. He says, "My daughter made me realize that if there's anything that's going to make a man of you, it's having your will broken by a little girl."